Whilst the team leader was still at the base, a further call came in from the police regarding a missing male walker. Two males in their early 20’s from the Isle of Wight had set off from Brackenclose to climb Scafell Pike via Mickledore. They reached the summit at 11:30 hrs but on their descent became separated in low cloud. The one who raised the alarm had himself found it difficult to navigate off the fell but got back to his car at 3.00 p.m. He was actually there when the team arrived for the fatality incident. His friend who was missing did not have a compass nor map and had limited wet weather gear, nor a rucksack. The decision was made to hold off a search until 6.45 p.m. at which time a full callout was made and SARDA and Keswick team were mobilised. 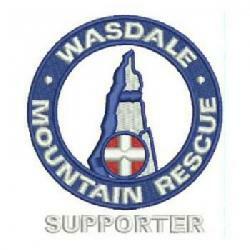 The missing person turned up at 7.30 p.m. after coming down Eskdale and getting a lift back round to Wasdale. Team members were called back to Base and SARDA and Keswick were stood down. 12 Wasdale team members were involved. and the incident was closed at 7.45 p.m.